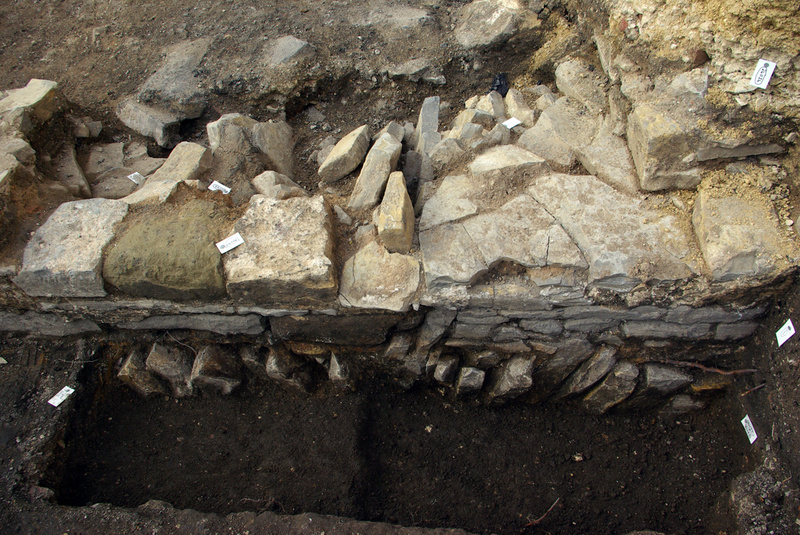 In March 2012 a group of volunteers with the assistance of Cotswold Archaeology staff undertook the hand excavation and recording of archaeological deposits and structures revealed within several archaeological trenches at the old Gloscat campus. 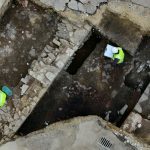 The three week duration of the dig allowed a limited amount of excavation to be undertaken, but remains from four archaeological periods spanning two millennia were revealed. 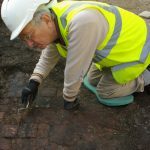 The earliest archaeological deposits encountered were of Roman date and consisted of a metalled surface thought to be either a road or yard area with a probable drainage ditch cut alongside. The metalling consisted of compacted gravel, had a slightly convex profile that would have aided drainage into the ditch. 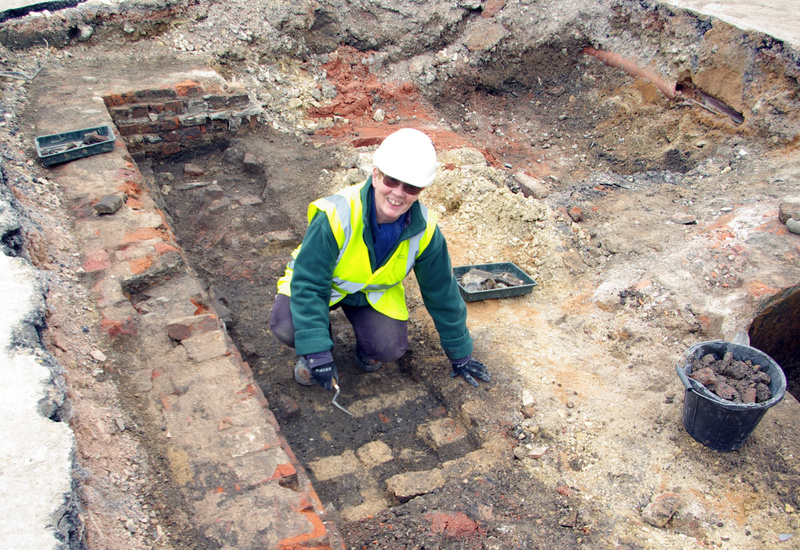 Fragments of Roman tile and brick had been incorporated into the surface. 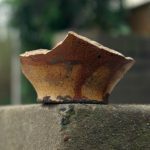 Finds of tesserae from a mosaic floor and Samian pottery in later deposits suggest the presence of a high status Roman building or buildings in the vicinity. 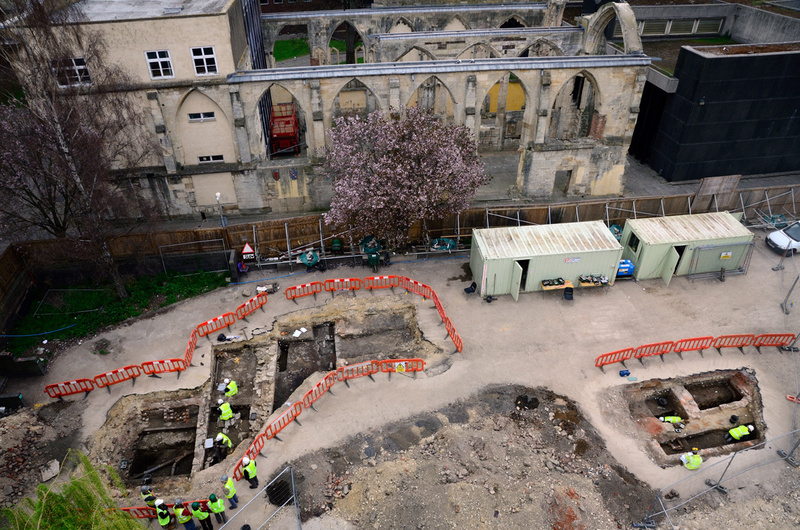 No structures dating to the period between the Roman’s exit from Gloucester and the building of Greyfriars were encountered during the excavations. 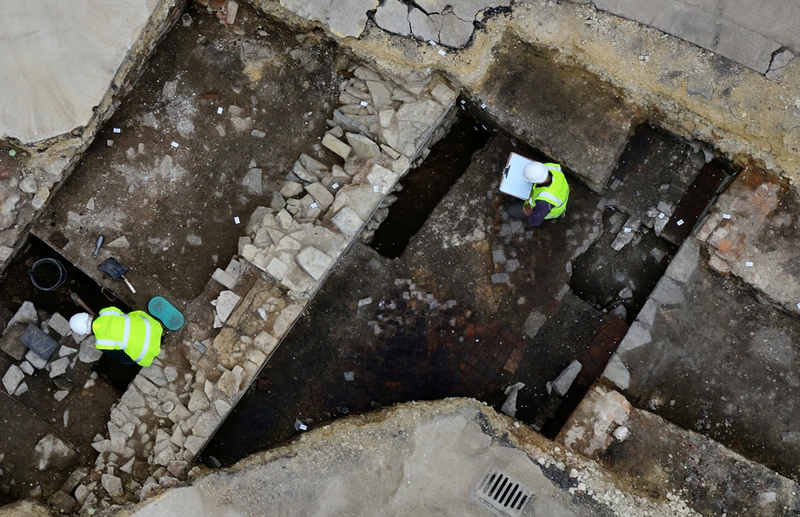 However, demolition rubble containing mortar and Roman plaster fragments was encountered and may indicate the pulling down of nearby Roman buildings during the Saxon period. The rubble was overlain by a ‘dark earth’ deposit probably formed through agricultural processes. 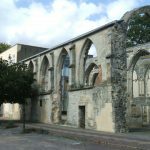 Later medieval features were uncovered and relate to the western range of buildings of the cloister walk on the south side of the Greyfriars Church built in the early 16 th century. These consisted of a tiled surface and a wall with an arched foundation. The wall was constructed of rough Lias stone slabs. A doorway within the wall opened out onto the cloister walk. A robber trench along the eastern side of the wall suggests a stone bench, common in cloister walks of the period, may had once existed alongside the wall. The tiled floor surface consisted of square red ceramic tiles, some with glazed decoration set in a diamond pattern, and forming a pathway along the eastern side of the wall. 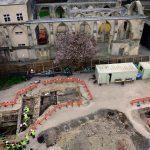 Evidence for the disuse and dismantling of the medieval cloisters was also noted during the excavation. A series of ashy deposits containing wood charcoal probably represented the burning of roof timbers. 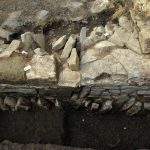 The ashy deposits were interspersed with layers of mortar fragments suggesting the dismantling of the masonry structure. The most intact structural remains dated to the post-medieval period and correlated with structures shown on historic mapping. 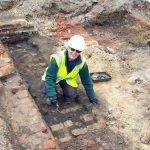 These included the north-eastern exterior wall of Friars Orchard, the rear wall of an early to mid 19th-century coach house to the west and the basement of a mid to late 19th-century property off Priory Place with associated structures in its rear yard. To use this map successfully, Microsoft Silverlight must be installed. 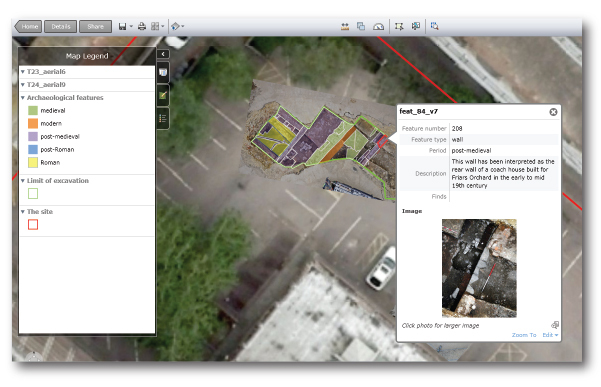 This is available as a free download from the Microsoft Silverlight website.